Whooo makes learning numbers fun? Our wise owl, of course! 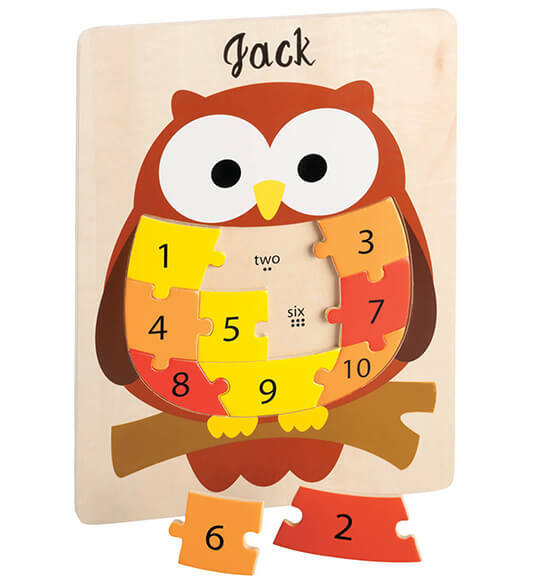 Crafted of wood, this colorful personalized wood owl number puzzle helps little ones learn numbers 1 through 10, while helping strengthen problem solving skills, develop hand-eye coordination, and enjoy old-fashioned fun. And whooo’s going to be the smartest when it comes to thoughtful giving? You are, of course ... this wooden puzzle is personalized, on us! Specify name; limit 1 line, 10 letters/spaces. 11 3/4" long x 8 7/8" wide. SMALL PARTS. Not for < 3 yrs. 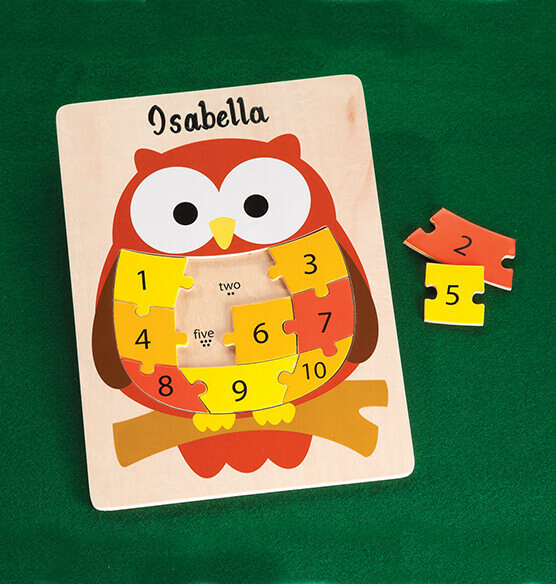 The personalized owl puzzle was a big hit with my grandbaby. My granddaughter loved seeing her name on the top. Great puzzle~with a grea price! The puzzles are so nice with the children's name on them. The kids loved the puzzles I bought the owl and the butterfly puzzle. My daughter loves owls and enjoys puzzles.